Often when kids are off school for summer break, they want nothing more than to splash in the pool and play video games. Sure, relaxation is important after a long school year. However, if they don't crack a book all summer, they are at risk of the summer slide--losing the information they learned the previous academic year. 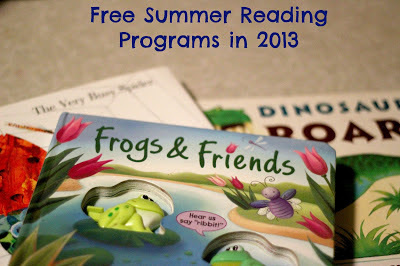 Barnes & Noble Summer Reading Program: Read 8 books, fill out a reading log, and get a free book (from a preselected list). Sylvan's Book Adventure: Students read books from a designated list and then take an online quiz. If they get the quiz right, they win virtual prizes. Showcase Cinemas Bookworm Wednesday: Read a book a week, fill out a book report form, and see the kids' movie showing every Wednesday morning for free! Junie B. Jones Reading Club: Sign up for the reading club and get a free starter kit, including a copy of Junie B. Jones and the Stupid Smelly Bus. Scholastic Sumer Challenge: Kids sign up and keep a reading log. Their minutes count toward the Read for the World Record challenge. They also win virtual prizes. Half Price Books Feed Your Brain Summer Reading Program: Read 15 minutes a day in June and July and earn Bookworm Bucks to spend at Half Price Books. Don't forget to also check your local library. Our local library has a reading challenge, and the top 25 readers get a special prize. Last year my son was one of the top 25 and was treated to a pizza and bowling party. Help prevent the summer slide and keep your kids interested in reading with some of these great programs!